An Imperial researcher has been awarded funding to develop a multiplayer video game to improve rehabilitation outcomes of physically impaired patients. Dr Paul Bentley, Clinical Senior Lecturer and Consultant Neurologist at Imperial College Healthcare NHS Trust, and his team have been awarded £1.1 million from the National Institute of Health Research’s (NIHR) translational funding scheme to build a web-based version of a social video game, called Balloon Buddies that could help patients with physical impairments improve their rehabilitation. The team will also use the funding to put Balloon Buddies and other interactive arm-exercise games on the web to make the world’s first rehabilitation social gaming network. 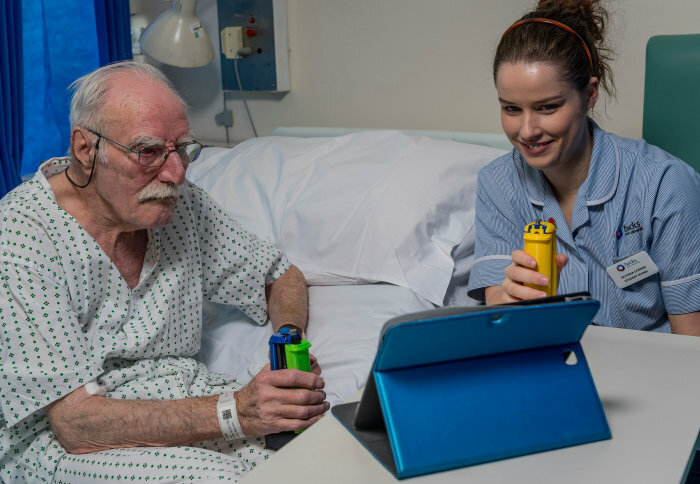 Balloon Buddies is a tool that enables those recovering from conditions such as a stroke to engage and play together with healthy volunteers such as therapists and family as a form of rehabilitation. The researchers have shown that this type of collaboration makes it more rewarding for the less-abled partner, more challenging for the better partner, and overall more fun for both, as they have to continuously work together to score points. In a previous trial, the team found that by increasing engagement with healthy volunteers, compared to playing alone, patients may be more likely to increase the effort they put into training, which could ultimately lead to greater gains in physical performance. The project represents a collaboration between Imperial College Human Robotics Group and Brain Sciences Departments; University of Southampton, and the startup GripAble Ltd.